I'm still exploring this particular direction in the tank. It's not always working out ~ and it takes forever to create these images so when I screw up, I feel like I just wasted so much time. It's been a lesson in patience and acceptance ~ and remembering that time is never wasted when you stretch and grow and learn something new (even if it's what NOT to do) along the way. At the intersection of Holy Buckets Street and I Can't Believe This Technique Is Working Boulevard, you'll find this piece. I am loving this direction. Meet me at the corner of Color and Movement. Nervous about this one...eeeeek! A few more rounds to go. Revisiting projects. Seeing things differently. Seeing things the same. Open to possibilities. Eager to continue. Willing to let it unfold. Committed to results. 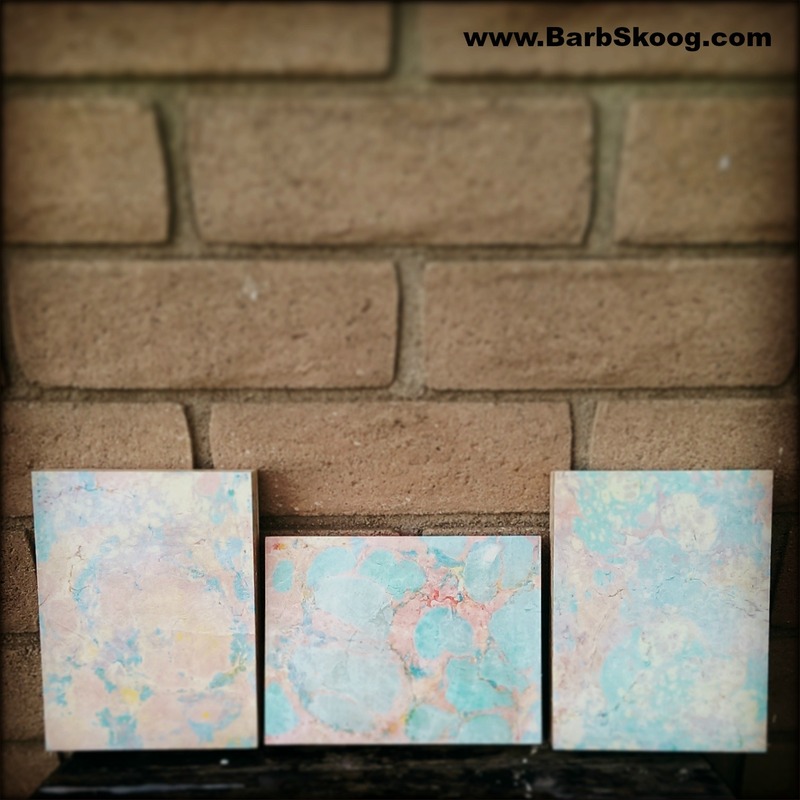 Current studio project: marbling over painted backgrounds. Waaaaaaaaay harder than you'd think. At least for me! The conditions for marbling this weekend were horrible ~ temps in the 90s and humidity levels barely in the double digits. So I needed to work quickly in the tank. That meant working small and working simple (no complex patterns with lots of strokes). I started out by creating simple backgrounds with vibrant colors and high-contrast colors. But small and simple can be beautiful too! Overmarbling the simple backgrounds with dense, bold colors or the same pattern but in a different direction takes them to the next level. Marbling can be such a finicky art form. I learned long ago not to fight the tank and instead adjust my expectations as well as my actions. And you know what? Some of my best work has come from these times. Work that may never have happened had I not been willing to make lemonade out of lemons. Another background piece for the collaboration New Ground that I created last week when Liz and I were working in the studio together. I really do love the Overmarble and how effective it is in creating dimension. This is a simple Waved Vertical Gel Git on top of another Waved Vertical Gel Git. I simply LOVE that green which I will never see again as I mixed it up on the fly using leftover paints. I only have a vague idea of what's in it. Size is 13" x 20". Paper is Arches. A background piece I created last week for the New Ground collaboration. The three elements in here are a Spanish Marble (1) with an Italian Vein (2) Overmarble (3). Size is 13" x 20". Printed on Arches. Hello Blog Subscribers and visitors! 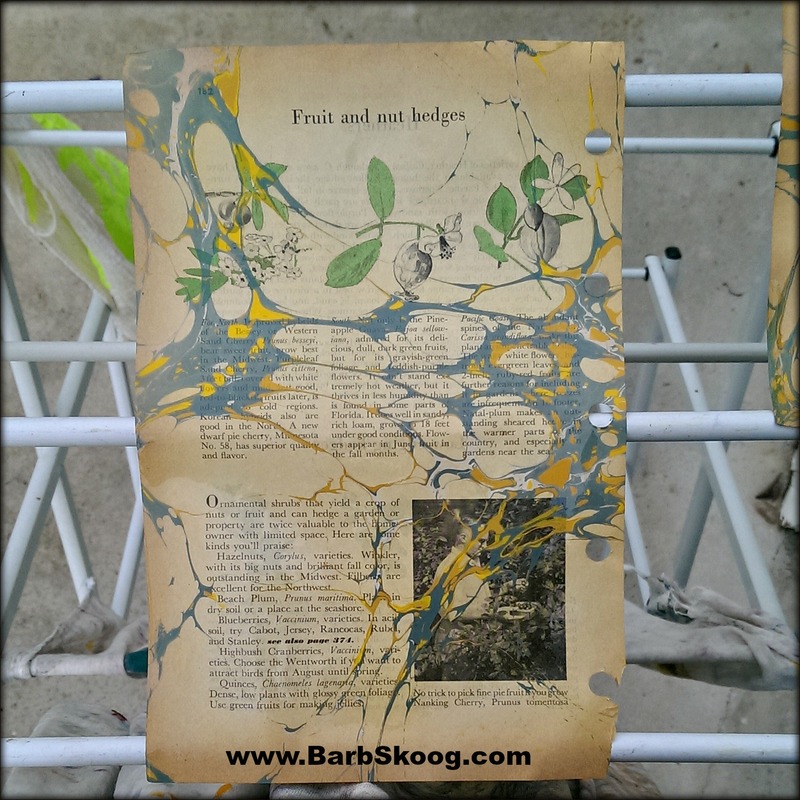 Welcome to the new BarbSkoog.com ~ a fresh website design to go with my new logo! Many thanks to those of you who had to re-subscribe to my blog. I'm thrilled to have you along for the ride ~ again! My friend, Liz, was in the studio with me last week as we continued to work on our collaboration, New Ground, and I wanted to share a few work-in-progress pictures. This session focused mostly on working with the masks we have been creating that are inspired by cultural patterns and designs. These masks are then applied to paper or fabric and marbled. The resulting white space is yet another area for us to work in. 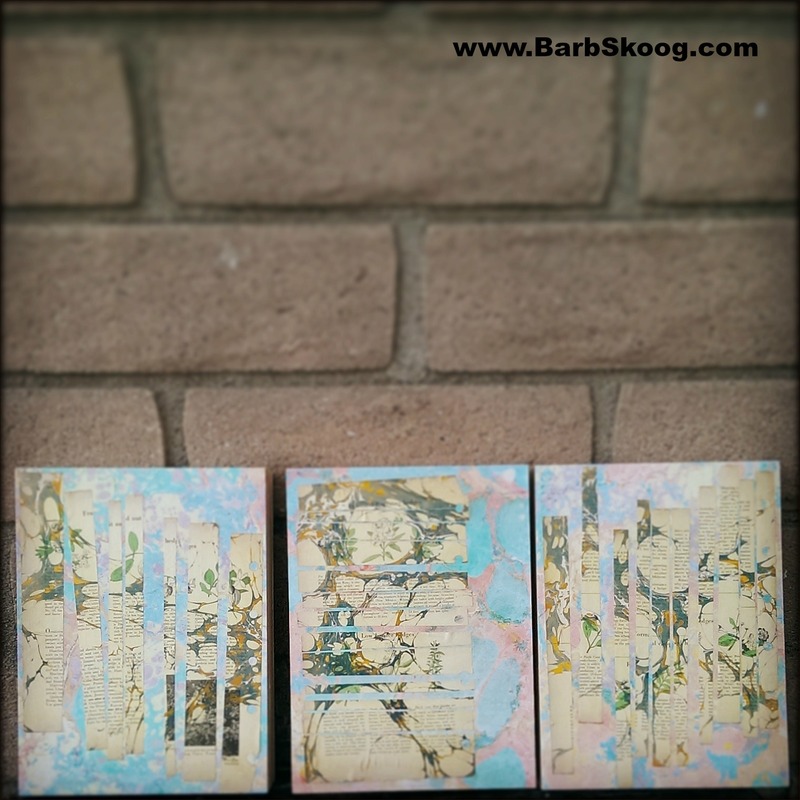 The pieces below are all on paper (Arches or Texoprint) and measure 20" x 25." Liz works her magic on a marbled Native American-inspired geometric pattern. A marbled Islamic-inspired geometric pattern. Believe it or not, these started out as a horrible mistake in the tank ~ wrong colors for an overmarble AND I needed more transparent paint otherwise it looked liked a blooby mess. But this is what I love about marbling: it's so forgiving. A last-minute tweak (tossed in the turquoise) and capturing the image on plain, creamy paper and suddenly I've gone from wrong to oh-so-right! 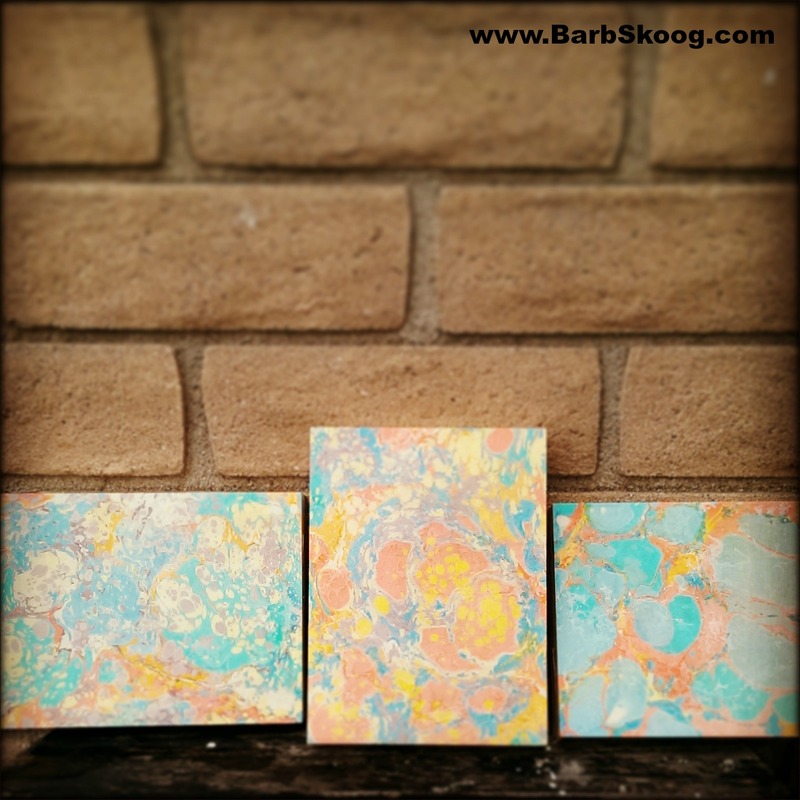 Today was spent marbling backgrounds for overmarbles for a special project I can't wait to tell you about! There are a few more layers I have in my head that I want to add here but I'll be taking baby steps with those. I'll share the process along the way. Stay tuned. Who knows what will happen!